According to Smart Growth American, very few children today walk to school though 30-40 years ago about 70% did. Today "It’s not safe, it’s not enjoyable, and the districts are so large that most kids are scattered far from the school." To me, this is a trend that reveals a significant loss of place. In order to feel a connection to place, I must be able to walk, ride my bike, ride a horse, or otherwise get around without the use of an automobile. 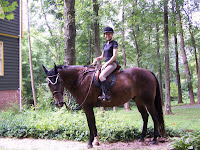 Here in my weekend home in Western Loudoun, I feel a strong affinity with the neighborhood and those who live here because I walk my dog and ride my horse -- every time I go out I see other neighbors who are outside walking or riding and I have the opportunity to chat with them, see what they're doing, hear what's new in the area. As a result, I feel connected and at home. All the "real places" I've ever visited in my life are built for walking (not primarily for the automobile) and people in those places are not dependent upon automobiles. The people in those places connect with other people because they're not separated by glass and steel as they speed from one climate controlled environment to another. But today even when children live within walking distance to school, very few walk. It's just not done anymore, it seems. I see parents in this area driving their children to the bottom of the driveway so the school bus can pick them up! There's a general perception that it is now dangerous for our children to walk, especially alone. Our perception of safety (or lack thereof) deserves a great deal of pondering, because it reflects a serious shift in how we perceive our world and our place in it.